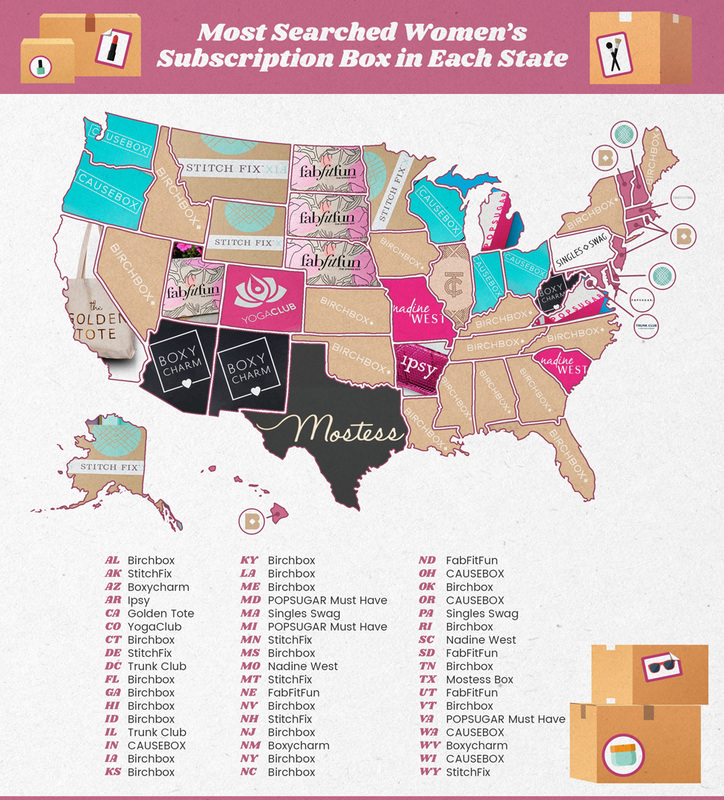 What Are the Most Popular Subscription Boxes? In 2018, we live in the age of convenience. From the backup cameras in our cars to the Amazon Echo’s on our kitchen counters, we are obsessed with just about any product that can make our lives even a little easier. It’s no secret the subscription box industry has capitalized on our not-so-secret love of convenience. With nearly 7,000 subscription box companies out now, there is a box with nearly every facet of our lives, and our convenience, in mind. Women can subscribe to personalized, hassle-free fashion boxes that promise to take their wardrobe to the next level. Men can get a fresh supply of razors and other grooming products delivered right to their front door. And with the emergence of meal-prep kits and dog food delivery services, families can avoid those notoriously inconvenient grocery store runs. All in all, subscription boxes have the potential to make just about anyone’s life easier in one way or another. The growing prevalence of these subscription boxes sparked our curiosity. At Empire Today, we know just how important convenience is to the American family as we’re in the business of making getting beautiful new floors easy. That’s why we decided to find the most popular subscription box. Thanks to Google search interest data, here’s what we found! So, what do women want? Well, it seems to depend on where they live. While Birchbox was the top box searched in the highest number of states, there were interesting trends in preferences across regions. Women from North Dakota, South Dakota, and Nebraska are really into beauty, wellness, and fashion, as FabFitFun ranks as their #1 subscription box. Southern women are interested in beauty products. Birchbox, which sends subscribers a personalized monthly mix of makeup, hair products, skincare, and fragrance samples, might as well be coined “the women’s box of the south,” as it is the most popular women’s box in Louisiana, Alabama, Mississippi, Georgia, North Carolina, and Tennessee. In the Pacific Northwest, women are all about giving back to their communities. CauseBox, which delivers a curated assortment of products that “do good and look good,” ranks as the top box in both Washington and Oregon. Offering everything from personal grooming kits to gaming-related merchandise, there is a subscription box suited for any guy’s taste. Although Loot Crate (geek- and gaming-related merchandise) is the overall most searched men’s box in the United States, men in Texas, Florida, and Georgia prefer the Basic Man Box, which provides fresh sets of monthly basics like socks, boxers, and t-shirts. Up north, men in Michigan and Wisconsin are surprisingly more into the SprezzaBox, which delivers fashion and lifestyle accessories like ties, watches, and sunglasses. 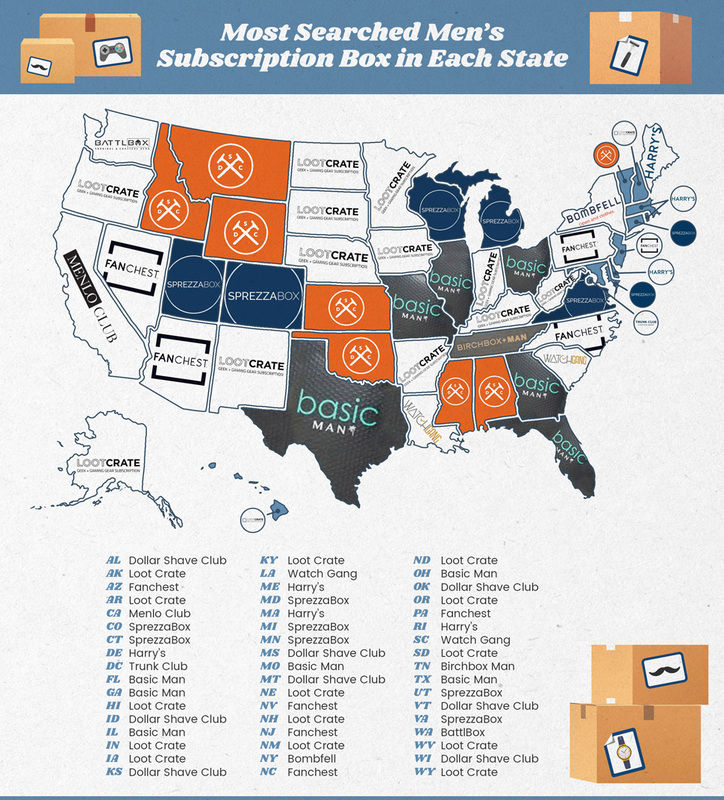 The Dollar Shave Club is also quite popular in certain corners of the U.S. In addition to being the most-searched men’s box in Idaho, Montana, and Wyoming, it also topped the charts in Alabama and Mississippi, but the Dollar Shave Club’s popularity doesn’t quite make it to Louisiana. Our four-legged friends are a part of our families. We include them in our holiday card photos and they pretty much own our camera roll, so it’s really no wonder that pet subscription boxes are highly popular. But which pet boxes are the cat’s meow, you ask? 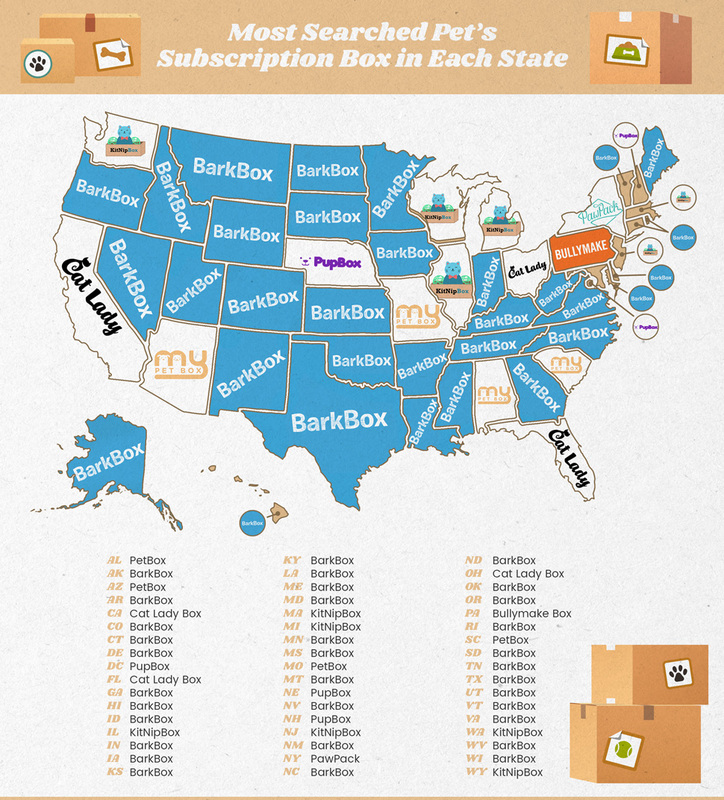 Barkbox takes the cake in terms of widespread popularity, topping the charts everywhere from Oregon to Maine and many other states in between. California is evidently for cat ladies, as the Cat Lady Box is the most popular pet box in the Golden State. MyPetBox, which is full of goodies for your pet, also ranked #1 in a handful of states: Arizona, Alabama, South Carolina, and Missouri. Even though pets are part of the family, subscribing to boxes that benefit the whole family is never a bad idea. What families look for in a subscription box can differ depending on where you live. For example, families in Texas and California are all about the Honest Co. Box, which offers household products to families, such as all-natural cleaners, eco-friendly diapers, and even plant-based laundry detergent. Families in Utah, Nebraska, Minnesota, and Georgia, on the other hand, must have a pretty big sweet-tooth, as The Candy Club is the most-searched box in these states. Kidpix, a company that provides a monthly delivery of “super cool kids clothes,” is a popular family box in Arkansas, Oklahoma, and Louisiana. Any assistance with meal prep that a subscription box can provide is especially desirable to families; as a result, it’s not surprising that HelloFresh is the overall most searched box for families. As for meal prep, Plated was the overall most-searched box nationwide. 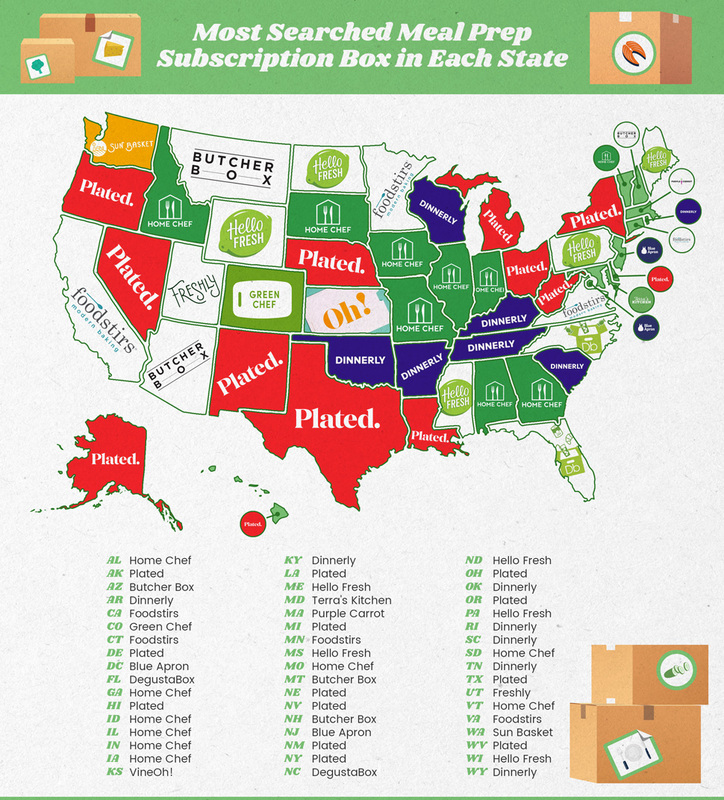 In addition to having extreme popularity in Alaska and Hawaii, Plated also took the top spot in Delaware, Louisiana, Michigan, New York, New Mexico, Texas, and West Virginia. 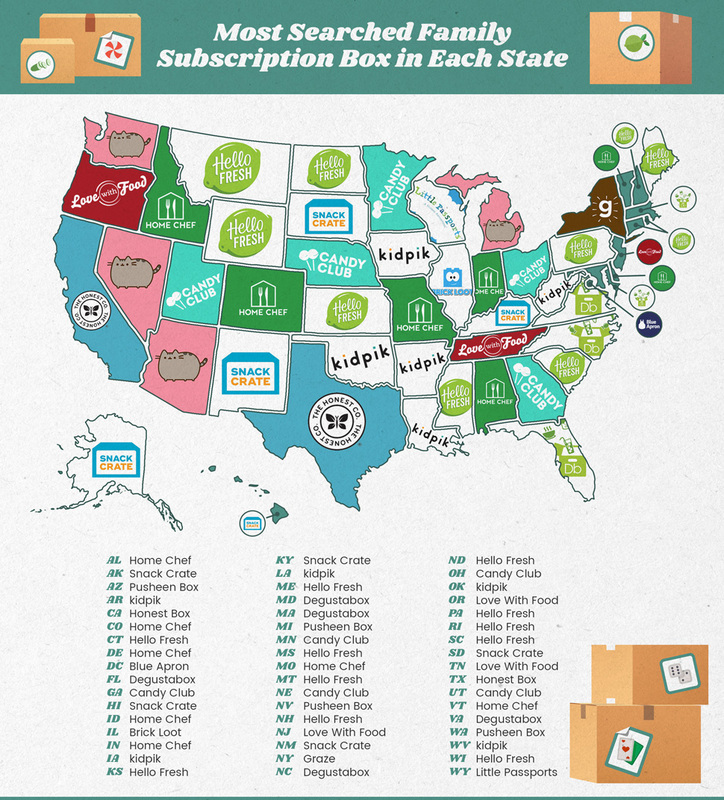 Home Chef, even though it was the 2nd-most searched box overall, was the top box in Idaho, Illinois, Indiana, and Iowa. Sun Basket, a San Francisco-based company that ships organic, sustainable meal-prep ingredients, was the most-searched box in Washington. 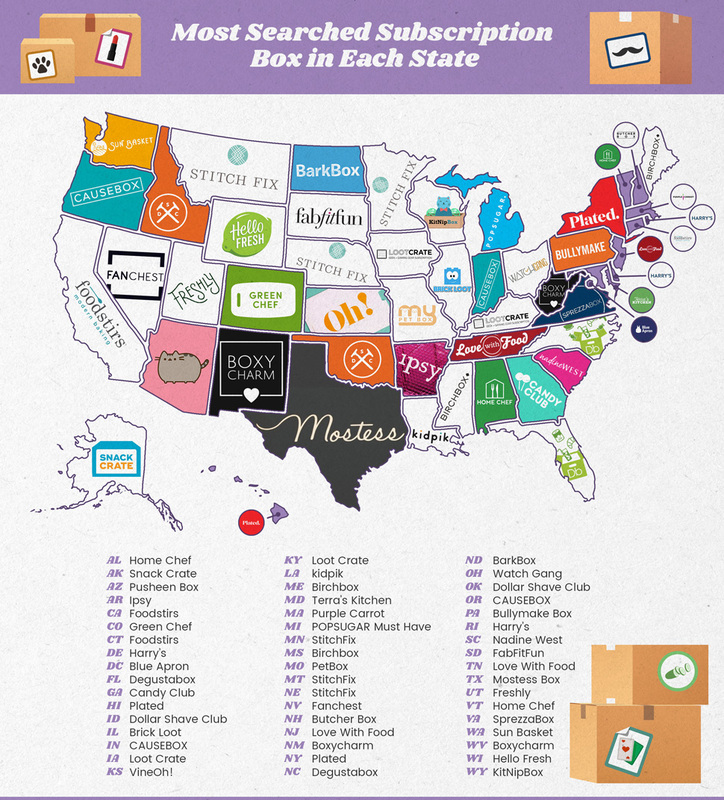 All in all, Stitch Fix was the most popular box across the board. The clothing subscription box provides subscribers with carefully curated outfits on a monthly basis. So many Americans don’t have the time to spend at the mall browsing stores, so it makes sense that they’d utilize a service like this. But, there were some fun takeaways we had to share about other types of boxes and state preferences. Evidently, Kansans like wine, as VineOh! is their most searched box. As for Illinoisans, they might be playing with Legos at this very moment, given that BrickLoot is their most popular box. Floridians, on the other hand, are really into the assortment of surprise food that the Degusta Box has to offer. No matter who you are, or where you are, there is a subscription box out there that can make your life easier. If you’re not currently subscribed to any boxes, we hope we’ve inspired you to take the leap. But, will you conform to the subscription box norms of your state, or will you branch out and be a trendsetter? The choice is yours.